Fixed several bugs in GPS support for blackberry. A new option in Advanced settings allows you to add a string to all web connections made by the application. This option is useful only on Blackberry phones. You can select ";deviceside=true;interface=wifi" to use the WiFi interface, or one of the other predefined options if you're using online maps and the map doesn't show up. Restart the application after changing this option to (re)load the map. A bug was fixed in zoom/map type switcher, the map was sometimes incorrectly moved when switching map types in zoomed-in levels. Several other problems were fixed. If you find any bugs or problems in the new version, leave a message on the forum. Added support for Walking Directions and Avoid Highways options. These are configurable in the Search screen. Application user-agent was changed to fix some compatibility problems with custom map providers and some operators. Advanced settings menu was fixed, it was not functional before. Poland and Czech Republic were added to the list of "home" countries in the search screen. (since v1.41.02) A new GPS option is available on Windows Mobile phones, GPSGate. As the internal GPS is not supported by default on most WM phones, this option allows MGMaps to connect to a 3rd party software (such as GPSGate or GPSPort) that provides a virtual GPS port. For more information see the topic on the forum. Other minor bugs were fixed. MGMaps v1.39.16 is also out, it includes some of the fixes in v1.41.03 — user-agent fix and GPSGate support. gMapMaker was updated to v0.7.1 beta 4, it includes the user-agent fix described above. Dmytro Dykhman is working on a few updates to MGMaps for Blackberry, he has added support for Offline Search (search for an address within a preloaded list of geocoded addresses) and a few other features. For more information and download links, see the forum. The Verisign certificate that I'm using is expiring in less than three weeks. I have applied for a new one, but the current versions of MGMaps signed with the old one will not install after August 22. I have started a topic on the forum where you can post requests to re-sign specific versions that you may need to install or re-install on your phone. Stay tuned for more important announcements coming this month! You can now export favorites to a KML file in the filesystem or import them from a previously saved list. In order to do this, open Menu->Favorites and select Export KML or Import KML in the menu. Tip: you can import placemarks from any KML file into the favorites list using the Import KML feature. Added support for OpenStreetMap Cycle Map, you can enable it in Settings/Map Types. "Cancel" now closes the menu completely, instead of going back to the parent menu. You can navigate through the menus using the arrow keys, up/down - scroll menu, right - open submenu, left - go back to parent menu. The "Startup" favorite is no longer shown in the favorites list. Fixed problem with odd/even zoom levels. Map versions were updated to point to the latest maps/imagery. Download the new version from the Download page, select "Development Version" and your desired platform. A new version of MGMaps (stable) is released, it fixes support for Live Maps Brasil and Yahoo Maps India and includes some other minor updates. If you want to try out new features in MGMaps, get the development version instead. It's not a typo. Latest Google Maps Mobile uninstalls MGMaps on Blackberry! I received several reports in the past few days from mgmaps users complaining that their application gets uninstalled, usually when the phone is rebooted. One of these users found the cause: Google maps checks for old versions, and while doing that it uninstalls all applications that contain "gmaps" in their names. This solution was suggested: To stop google maps from nuking MGMaps, go into the permissions for google maps and set "Module Management" to "Deny". See this forum thread for more information and discussion. The keys for the following actions are now customizable: move map (up/down/left/right), zoom (in/out), switch map type, show/hide menu. In order to configure the keys, go to Settings/Keyboard/Configure Keys and follow the instructions on the screen. Support for Live Maps Brasil was fixed. Two new map types: Flof (flof.com.ar, maps for Argentina) Naqsha (naqsha.net, maps for Pakistan). Other small problems were fixed. This version includes a partial redesign of the settings menu. The settings were re-grouped into a hierarchy of submenus, which you can quickly access by pressing the keys corresponding to the menu option numbers (for example, press Menu-7-2-1 for Settings/Maps/Map types). Panning speed control (Settings/Maps/Panning) — allows you to configure the speed/acceleration for the map movement. Double size mode (Settings/Display/Double size) — a "pixel doubling" effect useful if your screen resolution is high and the map appears too small. Note that this feature causes intensive use of the phone processor and the application may seem less responsive. Zoom levels control (Settings/Maps/Zoom levels) allows zooming 2 levels at a time in order to zoom in quickly to street detail, and to reduce the bandwidth used. Optionally show the speed in knots (Settings/Display/Units). More font type options (Settings/Display/Font). Download the new development version here. I have set up a KML file that allows you to view in Google Earth maps from Yahoo, MSN (Windows Live) and other sources. This is useful especially for areas where Google maps is not available, like Eastern Europe. In order to access the KML file or to get more information, visit www.mgmaps.com/kml. Fixed GPS support on Nokia Series 40 and other phones. Fixed full-screen mode on Motorola A1200. Fixed some problems on Blackberry phones. In addition, a first (beta) version of MGMaps is available for Motorola i880 and other iDEN (Nextel) phones. You can download it from the WAP page. For Motorola i930 use the generic version. Since last week, you can download the latest improvements to the MGMaps code as a "development" version. This version is available only for some platforms and may have serious bugs... but if you wish to help with development and testing please upgrade and comment on the forum. v1.40.00: Only MIDP 2.0 (or newer) phones are supported. Browse/Select Contacts were added as buttons in Settings/Map Browsing or Invite screens. v1.40.01: Adds support for maps included in the application jar file. v1.40.02: Some menus are displayed as overlays on the map ("submenus") — this should reduce the loading time. The icon of the application was changed. You can get the development version from the usual location (download page, WAP site). Added Brasil to the list of "home" countries in Search. Changes were made to the Bluetooth code to improve connectivity with some GPS receivers. Map versions were updated to show the latest maps and satellite imagery. SMS features (receive location by SMS, auto-start when receiving SMS) are now disabled by default when the application is first installed on the phone to avoid two of the confirmation screens. This new version adds support for multiple tiles per file and a custom hash size to configure the number of folders used to distribute the downloaded map tiles. It also adds support for 64-bit Windows platforms (XP Pro X64, Vista X64). Get it from the caching tools page. A new version of gMapMaker (v0.7 beta 2) is available for download. This version fixes some problems with the progress bar and allows downloading of map tiles over a few simultaneous connections (thanks to ghanashyaml who posted it on the forum). Get the new gMapMaker from http://www.mgmaps.com/cache! Released a few days ago, this version improves support for stored maps on Motorola phones and fixes some other problems. If you don't have it already installed, download MGMaps from the usual location. To check for your current version number, you can start MGMaps then select Help/About. The Menu box is shown by default in the bottom-left corner, it can be disabled in Settings/Display/Default Overlays. Support for stored maps was added for some Motorola phones (like the A780) and Siemens phones (like the S65). 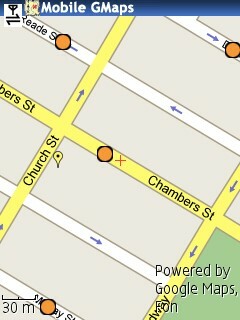 The versions of MGMaps for Blackberry phones were also updated and should work fine. Some problems with the GPS and stored maps were fixed and the stability was improved. Nutiteq, an Estonian company, has developed a mobile application based on MGMaps with some additional features localized for Estonia. The application is named Nutimap, and displays maps from an additional source (Regio), includes local points of interests (POIs) and can determine your approximate location based on the mobile network signal information. For more details see http://www.nutiteq.ee/nutimap.html. Another minor update: Support for viewing FON hotspots was fixed. They had changed the format of the output pretty much, so the mgmaps server is now preprocessing the lists of hotspots and providing them to MGMaps in a simpler format. Since we're at it, I have also created a dynamic KML for viewing all FON hotspots (not just a country) in Google Earth, this is available at http://www.mgmaps.com/fon/kml.php. User-interface improvements: the screen "snapshot" remains displayed after zoom, fixed some problems with the map "jumping" instead of scrolling smoothly. GPS web tracking updates and problem fixes. Scroll wheel and up/down keys should zoom in or out on Windows-Mobile PocketPC (with pen input). New map type: added support for OpenAerialMap. Removed the search zoom setting - search results are displayed in the current zoom level by default. Added support for 5 Hz GPS - you can enable it in Settings/GPS/Mobile Tracking. Support for calling phone numbers from search results was fixed. Other bug fixes and updates for compatibility with more phones. You can now adapt for MGMaps any maps you have, you only need to align and split them first with Microsoft MapCruncher as described in this tutorial on the forum page. You can now load KML files in MGMaps from your memory card using Services / View KML / Open file. New map types were added for Live.com maps Brasil, Live.com maps with terrain shading and Google Terrain maps — the latter is not available directly in MGMaps for viewing over-the-air, see this post for details. You can display the list of the latest search results or directions waypoints by pressing 6. In order to view the GPS screen while you have results displayed, press 2 to clear the map then 6. SMS features: you can now send a place (favorite, search result, GPS position...) over SMS to a friend that has Mobile GMaps installed. When such a message is received, MGMaps centers on that point and adds it as a favorite (configurable in Settings/SMS). An updated Blackberry version with support for stored maps is available. Currently works only on 8xxx series, for older BB handsets use the version of MGMaps with Navizon without stored maps support. Configuration service for enabling/disabling NAC input in search and Go-to forms. Added more key shortcuts for phones will full keyboards, key shortcut for Center on GPS only displayed if a GPS fix is available. While zooming, the application now stays centered on the last point it was moved to. Bug fixes for View KML, View Friends, alert timeouts, favorites, GPS functionality on Motorola E1000 and others. v1.38.05 is out and available at the usual location. This version fixes problems in search and directions, go-to (latitude/longitude were swapped), zoom level in favorites, multiple tiles-per-files in stored maps on Sony-Ericsson phones and some other problems. Nextel/Motorola iDEN support updated — positioning now defaults to assisted GPS, several problems were fixed. Motorola location API is now included in the main (generic) version of MGMaps, and it should work on Motorola E1000, A920 and others. The QJAE GPS API (Sprint) was updated to prefer assisted-GPS over standalone GPS. This sacrifices accuracy for quicker fixes and more stable GPS positioning. The "Browse" option in Settings/Map Browsing was updated, it now searches for a folder containing a cache.conf file and it no longer requires for the folder to be named MGMapsCache. Support for the OpenStreetMap OSMARender map layer was added. You can enable it in Settings/Map Types. Added option to rotate map by 180 degrees, key "7" can be used to sequentially rotate the map. A scaled image is now displayed while zooming in (previously such an image was displayed only when zooming out). Added option to "fake" user-agent (Settings/Advanced) in order to make MGMaps work with some carriers and plans like O2 Germany's WAP. Some fixes for the GPS, zoom, key shortcuts and other settings. Support for GPS on Nextel phones was added to the generic version. This feature is still in the initial phase and there are still some issues, it may take a while to get a fix and the application might lose the fix often — these will all be fixed in future versions. A memory leak on some Nokia phones (including N95) was fixed — the application will no longer crash after 15-30 minutes of use. I'm happy to announce that beginning with v1.38, Mobile GMaps supports NAC Universal Addresses. NAC (Natural Area Code) is an efficient and unified representation for both an area and a location anywhere in the world. MGMaps allows you to search for a location or an area by entering its code and displays 10-letter NAC codes for all places. Here is the full announcement. I have also released today v1.38.02 of MGMaps to fix several bugs in v1.38.01. You can download it at the usual location. I recommend all users to upgrade to this version, as it fixes some older problems too. /cache/ — tools for downloading map tiles and caching them in MGMaps for use with the stored maps feature. /create/ — Shustrik's .map file creation tool for MGMaps. Allows you to select an area and generate a file that you can use with the caching tools (gMapMaker or MapTileFE). /winset/ — instructions to install Mobile GMaps on a Windows-Mobile smartphone or PDA / PocketPC. /weme/ — mirror of the IBM Websphere Micro JVM for Windows-Mobile devices and for Windows XP — the latter allows you to run MGMaps on your PC. The view friends service was improved, you can see your friends and (optionally) public users, you can search for a friend or a public user. Stored maps updates. The mobile map can be automatically centered to the area you download. The storage structure was also updated and by default all map tiles for a zoom level are stored in the same folder to reduce the total number of folders created. For these new features to work, you must use mgmaps 1.38.01 and the Perl downloading scripts (Map Tile Cacher v1.25, MapTileFE v1.21) available at http://www.mgmaps.com/cache. Support in gMapMaker is hopefully coming soon. The GPS is automatically enabled and set to internal the first time the program is started, if supported by the phone. This new feature may cause problems with some phones, let us know if the application no longer starts and revert to v1.38.00 or v1.37.03 until fixed. Get the new version at the usual download locations. The image last displayed in MGMaps is saved and displayed when MGMaps is started the next time. The map can't be moved to the north or south outside the displayable area (approx. ±85.05 degrees). A few problems with GPS functionality and web tracking were fixed. A few problems with networking and connectivity were fixed. Full-screen mode is turned off by default on Windows-Mobile, this displays the menu on smartphones that can't show it otherwise. A few performance updates now make the application more responsive. Some more changes will be announced later. You may have noticed that the directions stopped working a few days ago because of some updates to the output format. This should be fixed now and directions should be working again just fine. You don't need to update the mobile application, but stay tuned for version 1.38 that should be out in a day or two. The "Report Problem" feature was completed, you should use that feature if have any problems with MGMaps. Note: due to a bug with Nokia S60 3rd edition phones and maybe others, the screen will temporarily freeze when you press "Continue" in Report Problem — to complete sending the report and continue using the application, don't press any keys for a few seconds until the backlight goes off. "View Friends" now shows when a user was last seen directly in the status bar as you move the map. The map can now be moved beyond 180 degrees longitude and it will be correctly wrapped. Also, invalid longitude coordinates are allowed and converted to the range that can be displayed. Some keys were updated for phones or PDAs with full keyboard: 'm' shows the menu, 'q' zooms in, 'a' or 'p' zooms out. Place details show the "straight-line" (shortest) distance from your current GPS position to the selected place for favorites, friends positions and KML results. Favorites can now be removed using the "Remove" option in favorite details. The "Update Check" does not correctly update the application if you have a signed version. Workaround: use Update Check to check for an update, if one is available close MGMaps and visit http://wap.mgmaps.com on your phone. The "1 Prev" and "3 Next" hints are shown even if there's a single search result. Note: you can turn off hints completely by unchecking the corresponding option in Settings/Display. The map quickly moves to your GPS position when you select a search result, if Mobile Tracking is enabled. Workaround: press "5" to temporarily disable Mobile Tracking when you wish to perform searches or to move the map manually. Font size for status bar is always small, even if you uncheck the Small Font option in Settings/Screen. The menu is not correctly resized when you switch Small Font on or off. Depending on the JVM used, Windows-Mobile phones or PDAs may not show the "Menu" option to open the menu. Workaround: press "8" to turn off full-screen mode, this should show the menu option. Or if your PDA has a pointer (stylus), click in the lower-left part of the screen. Download the new version here or visit http://wap.mgmaps.com on your phone. Mobile GMaps has slowly grown into a full-time job for me, and it's great fun! I believe in free software and I would like free as much as possible, however all the testing hardware, certificates and infrastructure cause increasing costs. If you can spare a few dollars, please donate and help us keep MGMaps free! Configurable max. number of places for View KML — you can view more than 25 places in a KML. Fixed a null-pointer exception occuring at MGMaps startup with Mobile Tracking enabled using the internal GPS. Other small updates and fixes. MGMaps version 1.37.01 fixes a problem with support for IBM J9 on Windows Mobile smartphones and PDAs. For more information on WM support and installation, see http://www.mgmaps.com/winset/. Added the View Friends service: you can now view on your phone where your GMap-Track friends are. Mobile GPS Tracking (Move Map) is now temporarily disabled for 30 seconds whenever you move the map manually — this allows you to browse and search the map while Mobile Tracking is enabled. The GMap-Track login screen is automatically displayed if you enter an invalid username/password or if you enable GPS Web Tracking without entering a username. Unpack the archive to a folder, "C:\Program Files\gMapMaker" by default. If you had an older version of gMapMaker before installing v0.5, remove the folder "C:\Documents and Settings\<your user name>\Local Settings\Application Data\gMapMaker". Browse to the folder where you unpacked gMapMaker (C:\Program Files\gMapMaker) and start the application. batch download: Open your browser, navigate to http://www.mgmaps.com/create, select the area you want to download. Click Generate and save the .map file on your computer. Back in gMapMaker, select "MGMaps mode, use a .map file" as the operating mode then click "Go" and select the .map file saved. single area: Enter the coords, select the zoom level and map type for the area to download. Make sure the cache folder path ends with "MGMapsCache". Make sure you have selected "MGMaps mode, use entered area" as the operating mode. Click "Go". When the download completes, you'll find all the map tiles in the selected MGMapsCache folder. Just copy this folder with all its subfolders to your memory card and configure MGMaps to use it. Move the map in MGMaps to the area/zoom level you downloaded map tiles for - use Menu->Go To and enter the coordinates, zoom level and map type. The application can also use a set of proxies for satellite imagery download in order to avoid having your IP address temp-banned by Google (which happens if you download many satellite tiles in a short time). For more information, see the forum (here or here). I'm happy to announce that gMapMaker, a Windows GUI tool by Damien Debin can now download map tiles and store them in a format compatible with Mobile GMaps. Get gMapMaker v0.5.0.0 beta, with support for Mobile GMaps here. A tutorial will be added soon, until then check the forum. Mobile GMaps v1.36.03 is out with some minor improvements and bug fixes. Download it here. Support for Yahoo Maps India was added. You can enable it in Settings/Map Types. The directions were fixed - the format of the results was recently changed. The language list is now retrieved from the server, new languages can be added without any change in the mobile application. Confirmations for favorites overwrite/delete are optional and can be configured in Settings/Screen. Added support for Sony-Ericsson GPS devices such as the HGE-100 connected over a serial port — the port is usually named AT5. Some new experimental features: Help -> Test Network and Help -> Report Problem (not complete yet). To download the new version visit http://www.mgmaps.com/download.php or http://wap.mgmaps.com. Due to a misconfiguration on the server, language files were not available yesterday for MGMaps v1.36.01. This problem should be fixed now — the new version includes support for Chinese Simplified and Chinese Traditional. Did you know Helio phones can run any Java applications? Neither did I, until an anonymous user sent a version of MGMaps built for Helio devices. (Thanks!) And after a quick look over the .smf file, it seems that any .jar file can be packed into an .smf file compatible with Helio by adding a short header and footer... read more in the forums. To install MGMaps on your Helio device, open http://wap.mgmaps.com/helio.html on your phone. Custom Maps: You can add custom online map sources to the map type list in Settings/Map Types — which by the way you can use to enable or disable the maps switched by the 0 key. Please note that the maps currently supported by this feature are limited to sources that follow closely the format used by the default sources listed (map tile size, map projection, zoom in 2x steps, map tile naming). Stored Maps: You can still download and use maps from Google as stored maps with the scripts available on the forum or with any other methods. I have recently received a letter from Google asking me to remove support for Google maps from MGMaps (copy of the letter below). I deeply regret this decision by Google and I believe that it is only going to result in making people use Google's competitors, but... that's their decision. So what other options are available to you? Well, plenty of them: MGMaps includes support for maps from Microsoft, Yahoo, Ask.com and OpenStreetMap.org (who all offer great maps by the way). I am also adding a configurable URL to MGMaps v1.36 where you can enter any map server of your choice. I am still hoping that Google will change their minds and return to the innovative spirit that brought us great products like the Google Maps API. But apparently this spirit is slowly going away. In the mean time, I am truly sorry for the inconvenience this may cause you. I will disable support for Google Maps and will update all current versions of MGMaps later this week. that displays maps tiles from our Google Maps for mobile application. application. Please confirm immediately that you will do so. The Send option was removed completely and replaced by Invite, that allows you to send an a SMS to a friend (you can choose from your contacts) and invite him/her to use MGMaps. Language files are now downloaded over-the-air when you choose a different language in Settings. This reduces the size of the jar and thus makes MGMaps work better on phones with less resources. The last Search results (or directions) are saved when you exit MGMaps and reloaded when you restart it - to show them again just press 2. Settings are saved to a backup store that should help if they get erased by memory-full errors. Username and password input encoding was fixed in Web Tracking settings. Keyboard improvements: you can press 7 to quickly rotate the map, the scroll wheel zooms on Sony-Ericsson P990, the softkeys work fine on Samsung E250. Total memory and free memory are displayed in the Help/Debug Log screen. Please note that these values are NOT correct on most phones and they are included only for debugging reasons. The total memory shows how much memory is visible to the application at a moment, but that is increased or decreased by the phone when needed. Stored Maps: the new version of the script (MapTileCacher v1.21) stores 1 map tile per file by default, as larger files slow down the application on most phones. bug fix: input in "Go to" or "Favorites" is now allowed in DD.ddddd, DD mm.mmm or DD mm ss format. other small bug fixes for KML support. Rotate screen (landscape mode): you can now view the map in landscape mode by selecting Settings/Display/Rotate Screen/90° clockwise or counter-clockwise. Stored Maps — the format of the cache was changed, now each file can contain several map tiles. This improves memory card usage and may also improve RAM memory usage on several phones. You can still download maps only with some perl scripts, for more details see the forum. Stored Maps — Folder Browser — you can browse for the MGMapsCache folder in Settings/Map Browsing by selecting "Browse" in the menu. Support for maps from OpenStreetMap tiles was added. You can enable or disable it in Settings/Map Browsing/Map Types. Search: added support for Denmark, Finland, Norway, Belgium as home country. Backlight level can be configured on Nokia and Sony-Ericsson phones. In addition the backlight should be reset (turned off) when exiting MGMaps if "Backlight Off" is selected in Settings/Display. The exit confirmation is now optional, it can be disabled in Settings/Display. Small fix in directions — the destination point is shown in the list of direction waypoints. You can download the new MGMaps here (select the "Development" version). Added support for friends and invites: you can now invite your friends to join gmap-track, and you can view your friends' locations in real-time on the map. The GMap-Track news page is now available at http://www.gmap-track.com/news.php together with an RSS news feed. Several problems with the website logic were fixed. More updates and features will be added soon, they will all be announced on the GMap-Track news page. (v1.34.00) Stored maps and offline mode: note that v1.33.11 is not signed, therefore it will ask for internet access each time a stored map tile is accessed. To avoid this problem, download the latest development version signed from http://www.mgmaps.com/download.php. (v1.34.01) Various updates and bug fixes for the GPS functionality, GPS over the serial port, debug log, language support, buttons, map browsing on Windows-Mobile, map tile versions. (v1.34.02) Added support for Google Maps Sweden. (v1.34.02) Mobile Tracking ON/OFF now quickly enables or disables the "Mobile Tracking Move Map" option. "Mobile Tracking Show Marker" remains enabled by default and can only be disabled from the settings screen. (v1.34.02) The directions were fixed. (v1.34.02) Other changes: the volume up/down keys on Motorola A1200 can be used for zoom in & out, other minor fixes. The second version with stored maps is available. This is still not a final version, but it is much more stable and the map speed was improved. See the forum for installation instructions. The first development version of MGMaps supporting local maps is available for testing, see the forum topic for installation instructions. This is an alpha version, which means that some features are not complete yet. Also, please note that several things including the format of the stored maps may change in the final release. If in doubt, stick with the current release (v1.33.10). The latest version of MGMaps (v1.33.10) fixes the internal GPS support on Nokia N95 and includes some other updates (French translation, updated map imagery by default). The latest version of MGMaps has some problems with internal GPS support on Nokia N95 and possibly other phones - until these are resolved use v1.33.08 instead. Directions: names are shown instead of coordinates when you select the GPS position as the source or destination for the route. Favorites: some bugs were fixed. GPS heading arrow: the arrow is now shown (if enabled) at the current GPS position and not in the center of the screen, the arrow tip indicates the GPS position. GPS Mobile Tracking: the Mobile Tracking On/Off option now only handles the Move Map functionality, and is temporarily disabled if Joystick Mode is on. The marker is shown by default and you can enable or disable it in Settings/GPS/Mobile Tracking/Show Marker. GPS Screen ("compass"): the screen now displays more info and should look differently depending on screen size, the compass now rotates as it should (the arrow moves and not the compass drawing). In addition, there are a few new shortcuts only recognized in the GPS screen: 1 - enable/disable Mobile Tracking, 2 - enable/disable Web Tracking, 7, 8 and 9 - change coord display mode. These shortcuts may change in the future. Many other GPS-related bug fixes. I stumbled upon this post on Ogle Earth while googling for "Mobile GMaps". Stefan Geens in Egypt took a trip into Sahara to visit the Whale Valley and tested Mobile GMaps on his Nokia N95 along the way, including the GPS tracking features on GMap-Track.com. He was pretty happy with the results (and the sight), see the final "report" here. Quote: "Mobile GMaps: I think I'm in love with this application. [...] A palm tree grove on the left? There it was on the image, right down to the individual trees. It's the stuff of Sci-Fi or James Bond, except now it's on my phone." Support for friends (almost ready) will allow you to view where some other GMap-Track users are, not just on a public map full of markers. The public page has become quite slow to load as more and more users signed up. The possible fixes involve clustering and/or dynamic loading of markers as the user moves the map. Smart Tracking — Mobile GMaps currently sends your position every few seconds, regardless of whether you're moving or not. If the interval is too large it may miss some points along your way, and if the interval is too small you would end up with too much web traffic. Smart tracking will fix all these problems. Save GPS tracks and view them on the website. You'll be able to start and stop "recording" your route on the phone and then upload it to the server to view it later or share it with your friends. History, see where you or your friends were at a given time in the past, also view the route travelled in a given interval. GMap-Track API — if you're into tech stuff, you may have noticed the requests made by mobile gmaps and gmap-track to http://www.gmap-track.com /api. Documentation and more functionality will be added soon as I complete the first version of the API. The latest version of MGMaps should now be completely functional. You can get it from the usual download page. v1.33.08 introduces some other bugs, reverting to v1.33.07 until further notice. Google hybrid maps were fixed (they were broken in v1.33.07). Extended shortcuts were removed and the key 9 now centers the map to your position as determined by the GPS (it's a shortcut for GPS Where-Am-I). The welcome screen was removed. The program checks for the latest map tile versions each time it starts and updates them if needed. The coordinate formats "DD MM.mmm" and "DD MM SS" are used in input screens such as "Go To" or "Edit Favorite" according to the application settings. More bug fixes for the internal GPS support and other updates. An update from Google broke the support for directions in MGMaps. Update to v1.33.07 to fix the problem. Google Maps now includes maps for more European countries including Turkey. Choose Help/Update Check in MGMaps to update it to use the latest map tiles. Fixed support for utf-8 in searches - you can now search for "GÃ¶teborg" or "Ð¼Ð¾ÑÐºÐ²Ð°" or "æ±äº¬" and you'll see the correct results in MGMaps. The maximum zoom level for Google Maps was updated to 19 to include the latest gmaps changes (3D buildings for a few US cities). The map is now automatically moved at startup to the first position obtained from the GPS. You can change this behavior in Settings/GPS/Mobile Tracking/Move Map at Startup. The speed and heading are now correctly detected on most JSR-179 devices, including Nokia N95. Are you having problems installing MGMaps on Windows Mobile smartphones or PocketPCs, such as Treo 700w, HP iPAQs, Samsung BlackJack, and so on? See the installation instructions at http://www.mgmaps.com/winset, contributed by an MGMaps user. Or search the forums "for Windows Mobile" (make sure you check the "search for all terms" option). MGMaps v1.33.04 fixes a problem with the internal GPS and adds support for more languages. Directions — the route is drawn faster and looks better. Settings — the "Load Defaults" option is now in the main Settings menu, the "Coordinate Format" option was moved to Settings/Display. The Internal GPS and GPS tracking code was improved. Other bug fixes and updates. MGMaps v1.33.02 is out, it fixes a problem with the input of the GPS tracking ID and includes some other small bug fixes. Get it here. The new version includes support for multiple languages. There are a few translations already included, but I'm still looking for translators into other languages. If you wish to help, see the forum to learn how to translate MGMaps messages. You can now track online the position reported by your GPS. To do that, sign up on GMap-Track.com, then go to Settings/GPS/Web Tracking in MGMaps, check the enable checkbox and enter your username and tracking ID in the form. You can only see your latest position on www.GMap-Track.com (and you need to manually refresh the map), but more features including "friends" and saving tracks will be added in the following days. The newest MGMaps displays the latest satellite imagery updates from Google. The zoom level is now counted differently to be in concordance with the zoom level as counted by Google Maps, WikiMapia and other applications. Specifically, newZoomLevel = 17-oldZoomLevel. The new version of MGMaps includes some bug fixes for Search and displaying places. MGMaps v1.28 (older stable version) was also updated to include the latest maps and satellite imagery. MGMaps v1.33 is currently under development, the new version includes support for multiple languages, GPS tracking and other features. The latest alpha version is ready for multiple language support and I'm looking for people to translate MGMaps into other languages — if you're willing to help, you can start translating right now! Translate all the messages without changing the corresponding message IDs. Test the new language — replace en_us.lng inside mgmaps-alpha.jar with your translated file and reinstall mgmaps on your phone. Let us know about your translation and we'll include it in the next mgmaps release. If you have any questions or need more info about translations check the forum or send a feedback message. Fixed the Get Directions feature — upgrade to v1.32.03 to restore support for directions in MGMaps. In addition, you can now see an estimated duration for each segment of a route. You can now choose between Google and Traffic.com as the provider for traffic information. Place names are displayed at the bottom of the screen by default (only for the selected or center place). You can change this behaviour in Settings/Screen/Show names for. The GPS icon was changed (it's no longer that bluetooth icon since GPS is not always accessed over bluetooth). Other fixes: search results are displayed correctly, the GPS icon was changed, marker images are always shown for waypoints on a route, the 2 key clears results or shows again the last search results. Google has recently updated the maps and satellite imagery, which now includes the entire Switzerland, Denmark and many European cities at 50cm or 25cm resolution. Keep your MGMaps up to date with the latest map versions by selecting Help / Update Check in the menu. Due to some personal problems, MGMaps development takes a break this week... Stay tuned for news next week. MGMaps can now draw the route when you use the "Get directions" feature. It still has a few limitations, it may be slow or look strange for long routes, but you can tune it (or disable it) using the configuration options in Search/Preferences. More info about these options will be added later. Other updates in this version include fixes in Search, clear the search results by pressing 2, About screen shows the program version on Nokia 6230 and other bug fixes. MGMaps v1.32.01 brings some updates and bug-fixes for directions and KML viewing. You can now use the GPS position or map center, as well as any search result or favorite as the start/end point for computing directions. The new version is available here. MGMaps version 1.32.00 is out now, it finally includes basic support for directions. The Search/Get directions option allows you to specify a start point and an end point and gives you a list of turning points that you can view on the map. The actual route line will be drawn in future versions of MGMaps. This version also includes a number of bug fixes. Download it here!. You can now move between search results or KML places using keys 1 and 3. Pressing one of these keys will center the map on the previous or next result (relative to the current selected result). Place names can now be displayed for places such as favorites or search results. For configuration, see the Settings/Screen/Show Names for option. Fixed Search bugs — searches should work fine now with compression enabled on all phones. Mobile Tracking now shows an information message when turned on/off from the GPS menu. Other small changes and bug fixes. Another known problem in v1.31.02: Nokia 6233 gives out-of-memory messages quickly after the application starts and you move the map a bit. Workaround: enable low-memory mode in Settings/Browsing. The latest alpha version with Sprint GPS support is now the default download for Sprint. See the forum for more installation and unlock details. You can find instructions for installing MGMaps on Windows-Mobile phones and PDAs at http://www.mgmaps.com/winset. Known Problem in v1.31.02: Search does not work on some phones. If this is the case with your phone, there's a workaround available: go to Settings/Browsing and disable the option Zip KML Results. Local search — this was named Find Businesses in previous versions. The improved version allows you to search for businesses or points of interest around your current position as determined by the GPS device, or around the current map position. Search country in Search/Preferences allows you to select a localized Google Maps site to perform the search. This is useful when searching by zip-code, when searching for businesses without specifying a place or country, or when there are places with the same name in different countries and Google can't decide by itself. You can always force searches to take place in a given country by including the country name with the search terms. Did you mean... — if the place you are searching for is not found but Google has suggestions, you'll see them in MGMaps. For example, try searching for "New jork" or "Munchen". GPS coordinate format — show coordinates as DDÂ°mm'ss" (degrees, minutes and seconds — default), DDÂ°mm.mmm (degrees and minutes — similar to the NMEA 0183 format), or DD.ddddd (degrees only with 5 decimals). You can configure the format in Settings/GPS/Other settings. The Powered-by text displayed on the map can be hidden by unchecking the corresponding option in Settings/Screen. Bug fixes in Subway Maps and other services. The Sprint GPS version was also updated to v1.31.02. It's still in alpha stage as it has not been tested much, but you can download it here. A Low Memory option was added to Settings/Browsing. Enable this option if you get out of memory errors in MGMaps (also check the Cache Size option). Note that the app interface will be slower with Low Memory enabled. Search results and KML data are now compressed in order to reduce network traffic usage and to speed up searches or KMLs. The backlight fix introduced in v1.30.12 made the app crash on some phones. This was fixed in v1.31.01. The MGMaps WAP page is back online. If you get redirected to the download page when you open it, clear your browser cache and try again. Internal GPS functionality is not available by default in Mobile GMaps on Sprint phones. That happens because Sprint has restricted GPS functionality to certified applications, and MGMaps is not certified. However, there is a version of MGMaps with Sprint GPS support available for download that works to some extent, but requires a few additional installation steps. You can now find detailed installation and unlock instructions in the MGMaps forum. Please note that this procedure may void your warranty. MGMaps v1.31.00 is out! It has proved to be pretty stable on phones with enough memory, therefore it's out of beta and is now the main version available for download. The old version 1.28.16 is still available on the download page. In addition, the download page was updated to include a Quick Download form that allows you to select the version and platform and then redirects you to download the correct files. An alpha release for v1.31 is available here. Final 1.31 will be out later this week. An alpha version with support for GPS on Motorola A780 (and hopefully A1000) is available here. An updated version 1.28 with support for GPS on Motorola E1000 and other Motorola phones is available on the download page. To use the GPS features you will need to unlock your phone using MotoMidMan or a similar application, as described in the forum. A final version with Sprint GPS support is available (jad and jar files). You will need to unlock the phone in order to use the internal Sprint GPS features. See the forum for more details. A "minimal" release of version 1.30 is available on the wap site (here are the links to the jad and jar files). It does not support GPS or any services, just maps/satellite imagery, search, favorites. More reduced releases of version 1.3x are coming soon to replace their 1.28 equivalents. The download page will be updated these days to get a Quick Download link. It will allow you to choose the version and platform then provide direct links to the jad and jar files. The vast majority of current phones only need the jar file (the jad is just a "useless" description of the jar). The GPS option was added to the main menu. It currently centers the map to the GPS position, in the next version it will display a GPS screen. Bug fix: holding a key down works as expected and no longer freezes the application. Bug fix: Backlight On option (Settings/Screen) now works on most Nokia and Sony-Ericsson phones. If you disable this option after using MGMaps with it enabled, you may need to restart the application for the changes to take effect. Bug fix: search code fixed (one of the previous 1.30 versions broke the search functionality). Bug fix: the networking code sometimes retrieved the same map tile twice leading to a higher network usage. Bug fix: zooming out quickly multiple times works fine now. MGMaps v1.30.11 beta with support for traffic info is available now, just in time for Christmas. It can display traffic info for major U.S. cities, with more areas coming soon. To display traffic information, select Services/Traffic Info and check the enable box, then save the setting. Download the new version here. Google has added maps for India, to view the new data in MGMaps you need to simply select Help/Update Check to load the latest map versions, then restart MGMaps. Repeated key presses are now handled correctly. MIDlet Data Size parameter was updated — hopefully this will solve installation problems on some phones. The networking code was updated, it should reuse existing connections whenever possible. Fixed Ask.com map browsing (it was broken for some zoom levels). MGMaps now asks for confirmation before exiting, as the exit option was too accessible and was often selected by mistake. Zoom accessibility: a rectangle is drawn when you zoom in, showing the area that will be enlarged. When zooming out, the entire screen image is reduced to show the area it will fill after the zoom. Note: This feature is still under testing. The zoom-out shrinked image can only be displayed on MIDP 2.0 devices. A few bugs were fixed in Search and View-KML. MGMaps supports "dynamic" KML files. You can now load any KML file, and if it contains a NetworkLink section the places will be displayed and updated dynamically as you move the map. The new version includes the latest satellite imagery from Google Maps. This is also included in the latest v1.28 release, 1.28.14. Bug fixes and improvements in favorites, GPS, hybrid mode features. ... supports Hybrid mode for Google, Yahoo and Ask.com maps! Get it here. Support for WikiMapia and FON was ported from v1.2x. Help/Download Meter — see how much data the application has transferred since it was started. If you are upgrading from an older version of MGMaps, make sure you have the latest v1.2x before installing v1.3x, otherwise the favorites/bookmarks may be lost. If you have an older version of mgmaps, upgrade first to 1.28.13 then to 1.30. Get the new beta here! GPS over Serial Port — The GPS can now be accessed over the serial port, this may eliminate the need of Navizon for GPS support on Windows-Mobile smartphones or PocketPCs. This feature was not tested much and depends on the JVM installed - if you have a Windows-Mobile or maybe a Palm PDA with the IBM JVM installed, try it and post your feedback in the forum. Send MGMaps to another phone over bluetooth from within the application. To do this, choose Send in the menu, select Bluetooth(JAD) or Bluetooth(JAR) and then Bluetooth device to choose the phone to send it to. If you choose JAD, the recipient will start the download of mgmaps from this website upon opening the file. If you choose JAR, your phone will (re-)download the jar file from the server (~120kB), then send it over bluetooth. This feature is experimental, any feedback or forum comments are appreciated. Zooming was improved — there's a delay between a zoom-keypress and the actual zooming, and you can quickly zoom in or out several levels by pressing * or # several times. In addition, during the zooming the new zoom level is shown in a slider in the right part of the screen. Post your opinions about this new feature in the forum. GPS/Move Map no longer "locks" the zoom level — you can zoom in or out while Move Map is active, the zoom level will be set correctly. The KML and Subway Maps services were ported from the previous version and are completely functional and improved: KML Info now displays a menu similar to the new menu in Search, and Subway Maps adds support for Philadelphia and Chicago subway lines (imagery from MetroMapr). Many bug fixes or minor improvements. You can get the new alpha here. Google has added road maps for most of Africa, so it was time for an update in MGMaps too. The newest maps are supported by Mobile GMaps v1.28.12 (released) and v1.19.24 (that will be out tomorrow). You may have noticed that the latest MGMaps v1.28 was released a couple of days ago, it only brings minor bug fixes as I've been busy with the development of the next release. Mobile GMaps v1.30 is still under heavy development, but here is an alpha version showing the current stage. What's new in this alpha? Map Caching — that's right, it was finally fixed! You can now specify the size of the memory cache in kilobytes (Settings/Browsing), as a number between 128 and 4096 (4MB). Please note that the application code and data may use up to ~800-1000kB of memory in addition to the value specified there. Map scrolling is faster, "enhanced" scrolling is enabled by default (you can disable it in Settings/Browsing). Bookmarks were renamed to Favorites. I think it sounds better and I'll leave it this way for the future versions. Markers options were removed, they are now named places and can be of two types: either user-set places (they are actually favorites), or server-set places (search results, KML data, WikiMapia places, ...). Pressing the center key will still bring up the list of places currently visible on the screen. Search History was added, as its name says it allows you to review your latest 20 searches and run again any of them. The Go To option opens a simple form that allows you to quickly move the map to any coordinates. Tip: you can also do that with the Search feature, just search for the desired coordinates in the format: 45.67N 8.9E, or maybe +45°40'12", +8°54'. The auto-start option was removed and the application displays the welcome screen only the first time it is run. The low memory option was removed, because of the different caching code, but it may get re-added if requested or needed. This is an alpha version, it does not include all the functionality present in v1.2x, some options in the menu don't work, services are not present or not tested, etc. The features that were tested and should be functional are: map browsing and caching, search, favorites, settings (which should be preserved if you upgrade from the latest v1.2x, but could still have bugs). I'll add more features in the following days, any major improvements will be announced on this page. Meanwhile you are welcome to test this alpha version. Get it here! If you like Mobile GMaps and find it useful in your daily life, if it saves you time and money, please show that you value my time, my expenses, my effort and my knowledge and consider a donation. Online donations are available through ShareIT, a large website dedicated to selling shareware applications. Mobile GMaps is free, but the process of donating looks like registering a shareware program. ShareIt accepts all major credit cards, checks, etc. ShareIt is a proven and secure company for selling software, they process thousands of transactions every day. The price is set to 10 EUR, but if you want to donate more you can "order" multiple copies. To donate online, click on the following link: Donate for MGMaps! The RSS feed for MGMaps has moved to FeedBurner; re-subscribe or update the URL in your feed reader if it was not updated automatically. The new address for the feed is http://feeds.feedburner.com/MGMaps. MGMaps v1.28.10 is out with some minor updates to map versions for Google Maps and Windows Live Local (Virtual Earth), and some bug fixes. Version 1.30 is under heavy development and should be out very soon with a lot of improvements. Need to find a free WiFi access point nearby? Now you can do that directly from your cell phone, using Mobile GMaps v1.28.09 and FON. FON is the largest WiFi community in the world, where people share their wireless Internet access and in exchange get free WiFi wherever they find another user's access point. To display nearby wireless routers and access points, select Services / FON in MGMaps and check the Enabled box. Pen support was improved, a small map control is now displayed to allow you to pan and zoom the map using the pen. Satellite imagery was updated by Google on October 3rd (see the announcement) and is supported by the latest MGMaps version. A bug in search was fixed - you can again call phone numbers directly from MGMaps search results. MGMaps now supports internal GPS features on Motorola phones like the A920, A1000, E1000 and others. If you have such a phone, download the special Motorola version available on the WAP page. You will need to unlock the application using third party software like MotoMidMan in order to allow it to use positioning features - see the forum thread for more details. It seems the idea to connect to the MGMaps server every time the app is started in order to retrieve the latest map versions wasn't that good after all, therefore it's been removed from MGMaps. In addition, v1.28.06 allows you to Update the application directly from the Check for Update screen. KML support was fixed — more KML and KMZ files are supported. The menu options can now be selected using the pen on devices with pointer support. The application now retrieves the latest map tile versions from the MGMaps server. This allows MGMaps to always use the latest maps, without needing to upgrade the mobile client, however it may add startup delays — let us know if you see long delays or freezes while starting MGMaps. Google has added Maps for Brazil and has updated Japan maps. Get the latest version of MGMaps (1.28.04 or 1.19.21) in order to support them on your cellphone! Updated Windows Live Maps support to the latest version. The menu can be displayed in full-screen mode on devices without keyboards, by clicking the pointer in the lower-left corner of the screen. However, if you are using such a device it is recommended that you turn off full-screen mode by pressing 8. Fixed map panning bugs in Joystick Mode. Joystick mode — when enabled, the numeric keys of the phone act as direction keys, moving the map in all directions (for example 1 moves it up and to the left, 2 moves it up, 3 moves it up and to the right, and so on). The softkeys and the last row of the numeric keys keep their functionality. You can press 5 as a shortcut key for this option. You can increase the size of the font used for the scale, menu, and position box. To change the font size, go to Settings/Screen. Note that this will not affect the font used on the maps, since it is pre-rendered into the map tile images. minor fixes in WikiMapia support and GPS functionality. WikiMapia support was improved — WikiMapia places are only loaded when the user stops moving the map, in order to improve the speed and responsiveness of the application. MGMaps is now using the latest satellite imagery update from Google. Other minor bug-fixes and changes. Frank Olaf Sem-Jacobsen has created a version of MGMaps that can perform tracking by reporting the GPS position to the ham radio APRS network. You can download this version from the WAP page. Where am I? I'll ask my phone... — an article in The Register about free mobile mapping solutions. WikiMapia support — WikiMapia is a Google Maps mashup that allows users to add tags and annotate locations displayed on Google Maps. MGMaps can show these locations automatically as you move the map. To enable this functionality, select Services/WikiMapia and check the Enabled box. More features (like WikiMapia search) will be added soon. Support for KMZ files — MGMaps can now show places in compressed KML files. The Navigate menu option was renamed to Go to. MGMaps finally works with GPS devices on Windows Mobile-based smartphones and Pocket PCs. The communication with the GPS is done through Navizon, read the news page for more information. Other minor updates in MGMaps v1.27.04 include bug fixes for saving bookmarks and improvements in subway maps. You can view places in KML files (containing geo-data for Google Earth). To start, select Services/View KML, then enter the URL to the file to view (for example http://dev.keyhole.com/trek/StarTrekPlaces.kml) and select Load KML. Once the file is loaded and parsed, you'll see a list of the places in the file and you will be able to view any of them to view on the map. To load data from another file, select Options/Other File in the list of KML places. MGMaps v1.27.02 adds subway maps for Washington DC and Boston MA, you can enable them in Services/Subway Maps. They are available only when the map type is Google Maps and only in a range of zoom levels. The map tiles are still provided as GIF images, which means they may not be displayed by some phones — this will be fixed as soon as possible. Some bugs with saving bookmarks were fixed. I'm happy to announce that starting with version 1.27.01, MGMaps works with Navizon in order to avoid Nokia S60 crashes due to bad bluetooth/java implementations, but more important to allow positioning without a GPS device. To learn more about Navizon, see their web site. In addition, Mobile GMaps can now work with GPS devices on Windows smartphones and Pocket PCs through Navizon. Install Navizon version 2.1.3 or newer. Get it from the Navizon download page or from the MGMaps WAP site. Start Navizon, allow it to connect to the internet, select Setup GPS and select your bluetooth GPS device. Leave Navizon running in the background (you can simply press the phone menu key while the program is running), then start Mobile GMaps version 1.27.04 or newer. You can also start MGMaps directly from Navizon. Go to Settings/GPS and set the GPS Device to Navizon, also set the GPS Sync option to the desired mode. Save the settings and that's it! Install Navizon version 2.0.1.2 or newer. Get it from the Navizon download page. Connect the GPS device by following the steps in the Setup Guide. Start Navizon, allow it to connect to the internet. Leave Navizon it running in the background, then start Mobile GMaps version 1.27.04 or newer. Go to Settings/GPS and set the GPS Device to Navizon, also set the GPS Sync option to the desired mode. Save the settings and that's it! The menu displayed when pressing the center key no longer contains the installed services, it contains the Zoom In and Zoom Out options, together with markers close to the cursor in the center of the screen (like bookmarks or search results). Selecting any of the listed markers will open a new window displaying specific details. You can access the Services from the main menu displayed when pressing the left or right softkey. Drag the map using the pointer — you can now drag the map using the pointing device on smartphones like the Sony-Ericsson P800, P9xx, M600. Some problems with the internal GPS were fixed. Any problems or suggestions? See the forum or report them on the feedback page. Mobile GMaps can now display subway maps for New York City (onNYTurf), London (TubeJP) and Berlin (Uberbahn)! To enable this feature, go to Services/Subway Maps, then zoom in or search for the desired city to see the maps. Unfortunately the map tiles are provided as GIF images instead of PNG and many phones cannot display them, but this will be fixed very soon. Full-screen mode is enabled by default (if available) when the application is first started. If you have upgraded from an older version of MGMaps, you can press 8 to turn full-screen on. You can press the left or right softkey to show/hide the main menu when in full-screen mode. Some bluetooth GPS tweaks and bug-fixes are included. Motorola internal GPS support was removed and will be re-added when it is fully functional. A GPS activity icon is displayed in the upper part of the screen whenever there is a GPS device selected in the settings. The meaning of the GPS icon color is explained in the documentation. You can disable this icon by unchecking the corresponding options in the Settings/Screen form. The altitude reported by the GPS device is displayed together with the position, speed and heading when GPS auto-sync is enabled. Bluetooth & Location API override advanced settings were removed, they were causing some phones to stop responding. Beta support for Motorola AGPS — the application adds support for the AGPS features on Motorola A920, A1000, E1000 and other phones that include the Motorola location API. This is in BETA phase and requires you to "unlock" the phone using 3rd party software to allow MGMaps to access the GPS API, as described in this forum thread. Some problems were fixed in the GPS code, image handling code, saving/restoring settings and in some other places. The position of the map (latitude, longitude, zoom level for the center of the map) can now be displayed in the lower-right part of the screen, if Settings/Screen/Default Overlays/Position is checked. When GPS Sync is active, the latitude, longitude, speed and heading received from the GPS are displayed instead. To differentiate between these two cases, the text "GPS" appears whenever the GPS position is displayed instead of the map position (they are not identical if GPS Sync is set to Marker). The maps were updated to display the latest version of Google Maps satellite imagery. Other minor updates were made to the scale and the bluetooth GPS code. MGMaps v1.26.02 includes an option in Settings/Advanced to enable/disable the GPS workaround for Nokia 6620/6630/7610 phones. If you have such a phone and if MGMaps crashes as soon as it connects to the GPS, you should enable this option, although it may introduce some delays when GPS Sync is enabled. Leave this option disabled if you have any other phone. The scale can now be displayed in U.S. units (miles or feet), by selecting the corresponding option in Settings/Screen. This was also added to MGMaps version 1.19.16 that was released today. An icon is displayed in the upper right corner indicating internet activity whenever a map image is downloaded. This icon can be disabled by unchecking Settings / Screen / Default Overlays / Network Activity. A new zoom level is available in Google Satellite imagery! It was there all the time, just waiting for me to discover it while playing with Google Earth and noticing some high-res images that were not available in Google Maps. This update makes Mobile GMaps display satellite images up to 4 times the max resolution available in the Google Maps web interface. These images (3 inches per pixel) are available only for some places like Cambridge, MA but also some parts of Europe. The Update option was removed from the Update Check screen — users must exit MGMaps before updating, there's no sense in keeping this option. The Settings/Overlay options were merged to Settings/Screen, it makes more sense to have them here. A networking bug was fixed, it present in MGMaps v1.1x and v1.2x, and was causing some phones (like the Motorola i860) not to download map images at all. Some GPS problems introduced with v1.26.00 were hopefully fixed. The map scale is finally displayed on the screen. Currently only metric units are supported, support for U.S. units (miles/feets) will be added soon. The scale can be enabled or disabled in the Settings/Overlays screen. The GPS Sync option now allows you to display a marker at the current position reported by the GPS device, instead of moving the map as your position changes. This is configured in the Settings/GPS screen that can also be displayed by pressing the extended key sequence 9 - 2. When GPS Sync is set to Marker, you can still move the map to your current position by selecting GPS - Where Am I in the services menu. You can now check for MGMaps updates by selecting this option in the Help menu. If an updated version is found, exit MGMaps and visit the WAP site to download a newer version. You also have the option to open the WAP site directly from MGMaps, but the update will not work if the phone leaves MGMaps running in the background when it opens the WAP browser. The search features are now based on Google's KML output format, this reduces the bandwidth used by the searches and makes them about 10 times faster than before. Some bugs with the GPS selection window were fixed, but it's still recommended that you select the GPS device while viewing the maps, not in the welcome screen. Together with v1.26, a new v1.1x version is out for those of you that do not use MGMaps v1.2x for various reasons. Version 1.19.15 includes the scale and the search speed improvements from v1.26. The MGMaps server has experienced some serious network outages in the past 24 hours, and they don't seem to be over yet. I'm currently looking to move MGMaps to another server, if you want to recommend a good hosting provider with reasonable pricing drop me a message using the feedback form. Google has finally updated Maps to include the high-res satellite imagery present in Google Earth 4. The maximum resolution was not increased, but high-res images are viewable for many parts of the world where they were not previously available. Get the latest version of MGMaps (v1.19.14 or v1.25.08) for the mobile experience! There's an option in Settings/Screen to keep the backlight of the phone display always on. This feature is useful if the backlight keeps turning off after a few seconds and the maps have not yet loaded, but it is broken on several phones including my Nokia 6600. The application is more responsive when several markers are displayed on the screen. Some search problems were fixed in v1.25.06 and 1.19.13, if you have an older version upgrade to the latest one for searches to work correctly. Get the latest version of MGMaps (1.25.06 or 1.19.13) and you'll see a new level of detailed satellite imagery that is not yet available in the web interface of Google Maps! To access it, set the map type to satellite and zoom in as much as you can. The map now shows markers for all the search results whenever you perform a search. To change marker settings, select Settings/Markers in the menu. Support for Virtual Earth (Windows Live Local) and Yahoo Maps was fixed and updated to the latest versions. Google Maps has added detailed maps for Australia and New Zealand, get the latest version of MGMaps to add support for them on your mobile phone. Version 1.25.03 is out to fix some bugs related to GPS settings and features. Most Blackberry phones still do not support the GPS-enabled code, if you have such a phone download version 1.19.10 or 1.23.05 instead. Google Maps now includes street maps for most of Europe, and supports local searches. For the mobile experience, get the latest version of Mobile GMaps! Version 1.25.01 is out, it fixes some settings-related bugs introduced with v1.25.00. Everyone who downloaded v1.25.00 should update to the latest version. v1.25.01, the latest version, with full-screen and GPS support (internal/JSR-179 or over bluetooth/JSR-82). v1.23.05, without GPS support, but still supporting full-screen and markers. Some phones (Blackberry) were reported not to support later versions — until the problems are fixed this is the version to install on such phones. v1.19.09 is based on an earlier design of the application, provides only basic mapping functionality, but is smaller and should be supported by older phones too. Get it if versions 1.2x do not work. These and a few older versions are available on the WAP site for direct download to your phone. All versions since v1.02 are still present on the WAP site and available here. MGMaps version 1.24.03 fixes some problems with non-bluetooth enabled phones, improves GPS support and uses the latest version of Google map tiles. Get it here! Mobile GMaps version 1.24 beta is out with experimental GPS support! the external GPS receiver can send GPS coordinates in the NMEA 0183 standard over bluetooth. your phone supports bluetooth AND the JSR-82 standard for bluetooth access in Java applications. Some PDAs do not support JSR-82 even if they have bluetooth. GPS selection is saved automatically — your GPS device will be used as soon as you have selected it in the bluetooth devices form and will be remembered when the program is restarted, even if you do not save the settings. the application always connects to the GPS device (over bluetooth) if GPS Device is selected in Settings/GPS. To disconnect, uncheck the Select checkbox. GPS settings cannot be changed/saved while in the welcome screen. Choose Start to start displaying the maps, then Settings/GPS to change these settings. some phones will ask you to allow connectivity to the bluetooth device when you select it and at subsequent restarts of the application — make sure you select "Yes" or "Always Allow" in the confirmation form. the code for the GPS selection form is loosely based on the Bluelet component. You can check the usage and configuration instructions for details about the new GPS options. The new MGMaps is available for download on the WAP site, enjoy! I have recently made a few small changes to this website. The documentation and FAQ are now both in the Help section, together with the list of phones and operators supported/not-supported by Mobile GMaps. The to-do list is now in the News section, where you can also view some of the websites that have reviewed MGMaps. In addition, MGMaps version 1.23.05 now becomes the default version to download (the usage docs were updated too). Of course, v1.19 is still available at the WAP site. And by-the-way, the GPS-enabled version of MGMaps will be out this Friday, March 31st! Version 1.23.04 beta is out, it re-adds support for the "simple" map panning mode, present in versions 1.1x. This will make the application more responsive on many phones. The v1.2x "enhanced" map scrolling mode is still available and can be enabled in Settings/Browsing. The latest versions of Mobile GMaps (1.23.03 and 1.19.07) now support Ask.com maps in addition to Google Maps, Yahoo Maps and MSN Virtual Earth (Windows Live Local). Mobile GMaps is one of the five finalists for the Java.com Application Award at the Fourth Annual Duke's Choice Awards! Read more details, or Click here to vote for MGMaps! Versions 1.19.06 and 1.23.02 are out, they fix support for MSN VirtualEarth (a.k.a. Windows Live Local). You can switch between Google, MSN and Yahoo maps by selecting the corresponding option in the Settings (in MGMaps version 1.19), or by using the Navigate menu and/or the 0 key (in v1.23). Full-screen mode support, not enabled by default. To switch full-screen mode on/off, press 1, or check/uncheck the box in Settings/Screen. This feature is not supported by all phones, and has problems with some that support it. For example on Nokia 6600 you will be unable to access the menu while in full-screen, as a workaround switch full-screen off whenever you need to access the menu, then switch it on again by pressing 1. The program can show the cursor in the center of the screen, which is useful if you want to figure out where you will zoom in/out. Option configured in Settings/Screen. The latest versions for Google maps and satellite images are supported. The Services menu allows you to quickly zoom in/out or toggle a marker, in addition to searching. You might find it even easier to press # for zoom-in, * for zoom-out or 7 for toggling markers. Google have enhanced their satellite imagery recently, so I've updated Mobile GMaps to support the new aerial images that have two more detail levels. Visit the WAP site to download an updated version of MGMaps — 1.19.04 or 1.22.03. The search problems were fixed, the search feature should be again fully functional in the latest versions of MGMaps (1.19.03 and 1.22.02). It is recommended that all users update to one of these latest versions. Hint: try v1.22.02, and if you can't run it or if it is too slow on your phone get v1.19.03 instead. There have been no major updates to Mobile GMaps in the past couple of months, and I'm not planning many such updates soon (GPS support over bluetooth is an exception to that, so stay tuned). Map/satellite tiles are only available in 256x256 sizes, which are difficult to cache and display on mobile phones due to the limited memory. Directions are "obfuscated" in the search results from Google, that's one of the reason why they are not present in MGMaps. I would need to have additional code in the mobile app just for decoding them. Search results are full of information useless for the mobile application. A typical search returns ~40-50kB of information, that could be concentrated in 1kB or less. Google has an official mobile application for browsing their maps, that overcomes the drawbacks above (but uses its own web service, and has other disadvantages). As far as I know, Yahoo/SBC/Cingular/Nokia are planning a phone that I'm sure will display Yahoo maps, and there are some free windows-mobile applications that can display MSN VirtualEarth maps. And last but not least, the licenses from Google, Microsoft or Yahoo do not allow commercial applications based on their data. I've recently found that the search features in MGMaps no longer work, because Google have updated their map search results format (Guess what, they are now using HTML instead of XML for search results. What's next, binary-proprietary format?). This is another proof that unofficial Google Maps support is not a solution for the long run. I'm working to restore search functionality, and I'll release updated versions when it's ready. Mobile GMaps is featured on java.com! Versions 1.19.01 and 1.22.00 are released. Mobile GMaps now supports Yahoo! Maps. I consider this to be a minor improvement, since they use the same data as Google Maps, and are available only for the U.S. and Canada. MGMaps performs all searches using Google Maps, regardless of the current map displayed. Map modes are now called map types (I think it sounds better). You can switch between a subset of map types using the 0 key. Some extended shortcuts were added: 9-0 switches map types (modes) in reverse order, and 9-6 bookmarks the current position. Fixed migrating bookmarks and settings from v1.1x. I've decided to continue to maintain version 1.1x, so I have released v1.19 beta. It has some small improvements, including support for the latest version of Google Maps. Three-number version — MGMaps version now consists of three numbers: x.y.z, where x is the major version number (currently 1), y is the minor number, and z is the fixup version. Fixup versions will be released silently (not announced in this news page). Note that some Series 60 phones (like my Nokia 6600) will display version numbers as x.y (without the fixup version) when downloading and installing MGMaps. Fixed searching and saving settings in the welcome screen (this was broken in v1.20). Fixed the View Info option for search results. When performing local searches, search returns an additional result for the place around which the results were found. This additional result is the last one on the list and its name starts with "Near: ". The current position can be saved as the startup position when the application ends — this will allow you to resume browsing the map from where you were the last time. Enable this option in Settings/Browsing. Additional markers (map pins) were added for the bookmarks, and they are now automatically shown by the application. To hide them, disable the corresponding option in Settings/Markers. Markers can also be saved when the application ends, configure this option in Settings/Markers. The MGMaps Forum is up! Discuss here any problems or questions about Mobile GMaps. MGMaps features a rewritten engine that allows future extensions and custom services. Uses the latest version of Google Maps that splits load over four GMaps servers and displays more details for low-zoom maps. Extended keyboard shortcuts were added — they can be accessed by pressing 9 followed by another key. The map can now be controlled on a pixel-level basis and it moves continuously as long as you keep the direction key or joystick pressed. Some more fixes for saving settings: a versioning system was added to allow settings compatibility with future versions. Locations are now called Bookmarks and are stored differently. Some more confirmation screens were added for overwriting existing bookmarks, or loading default settings. The provider setting was removed. You can switch between map & satellite modes, as well as between Google and Microsoft maps using the Switch Mode option (key 0). Modes currently switched by this key can be configured in the Settings/Browsing form. Gauges or scrollbars are no longer used for zoom level or for cache size, instead you can enter the zoom level or cache size using text fields. These controls were broken on some Blackberry phones. The Markers menu was added. For now, it allows you to place markers without any associated text (extended key shortcut: 9-7), but more functionality will be added soon (like auto-placing markers for bookmarks, search results or other points). The Services menu was added to contain all services. The only service present in v1.20 is the Search (shortcut: 9-1), more services are coming soon. The Fire key (or joystick click) now opens the Services menu, instead of altering the zoom. You can still zoom using the * and # keys. You can choose the local Google Maps service to use for searching — configure it in Settings/Browsing. You can view search result details like address, phone or distance — use the View Info menu option in the search results list. Other small fixes were added to the search result parsing code. MGMaps processes the latest version of search results, which are about 30kB long, so it may take a few seconds for the search results to be completely downloaded to your phone. The Settings were also splitted into several forms, they can be accessed in the Settings menu/list. Various bug-fixes were made to the networking code, including proxied connections. The documentation pages still refer to version 1.1x, that's why v1.20 is not the default one to be downloaded. As soon as the web site is updated, v1.2x will become the default. Mobile GMaps version 1.18 beta was released to fix some small issues in v1.17. Version 1.20 of Mobile GMaps is currently under testing, and should be out in a few days. It features a rewritten engine, and is ready for future additions like Google directions and custom services. It also brings some "visible" improvements to the map panning system, settings and bookmarks storage, adds support for markers, more keyboard shortcuts, and many other features. Stay tuned! Mobile GMaps version 1.17 beta is out, it fixes some small problems with the previous version. This should be the last version of its branch, with version 1.20 coming up next week. I am currently working on rewriting the engine of Mobile GMaps. A lot of new features will be added starting with the next version, which should be out by the end of next week or in early October. Mobile GMaps version 1.16 beta was released. It improves support for Sony-Ericsson K750i and other phones with connections that need proxies. I have received feedback from several users, MGMaps now works on Treo 600 and 650 PDAs, and most likely on all other Palm-based PDAs (like Tungsten or Zire). Mobile GMaps version 1.15 beta is out, it fixes some small bugs. Visit the WAP site to download it. Mobile GMaps version 1.14 beta is available for download, a number of minor issues were fixed in this version. Mobile GMaps version 1.13 beta is out, it fixes a small issue with slower internet connections. Visit the WAP site to download it. Mobile GMaps version 1.12 beta is out. It fixes a memory leak in debug/error messages, adds detection of more errors and some other minor fixes. See download instructions. Mobile GMaps version 1.11 beta is out. It brings a great new feature and many other small fixes. MGMaps can now display MSN Virtual Earth maps and satellite imagery! So why use Virtual Earth when you have Google Maps? I can't think of many reasons, but here's one: maps for Europe are more detailed in Virtual Earth. You can switch between Google Maps and MSN Virtual Earth by selecting Settings in the main menu of the application. Note that all searches are still performed using Google Maps. A Help menu was added, it contains the About option present in previous versions, it also contains a list of keyboard shortcuts. In the future some usage instructions may also be added. An error handling feature is under development, it will help you and me figure out why MGMaps doesn't work on your phone (if that is the case). For now, you can see debug messages by selecting Help -> Debug. The useless Mark Center option was removed. Map pins are coming soon. Some alert messages were removed, they were also useless. Some more fixes for saving settings. Hopefully all future versions will be able to upgrade from 1.11 without any issues. Mobile GMaps version 1.11 uses new-style maps, that don't seem to work on older Nokia phones. See the list of supported phones for more details. If your phone is listed to work only with versions 1.0x, please download version 1.08. Mobile GMaps version 1.08 beta was released to fix support for satellite images. This is probably the last version of the 1.0 branch, support for old-style maps will be removed in versions 1.1x but may be re-introduced in future versions if needed. I have just noticed that Google removed support for old (cartesian-projection) satellite imagery. This means that satellite imagery does no longer work in Mobile GMaps versions 1.0x. To fix that, download version 1.10 or wait for the next version of the 1.0 branch (1.08). If you like Mobile GMaps and find it useful in your daily life, if it saves you time and money, please show that you value my time, my expenses, my effort and my knowledge and consider a donation to me. See the homepage for more details. Mobile GMaps version 1.10 alpha is now available for download on the WAP site in the Other versions available section. This version uses the newest Google Maps tiles for maps and satellite images. The new map tiles provide more information, like one-way streets and maps for the entire world (detailed maps only for US, UK, Canada and Japan). The new maps are available in PNG format, which makes the PNG images option useful only for satellite images. However, these map tiles are larger (256x256 instead of 128x128) and may break support for some older phones (Sony-Ericsson T610/T630/Z600 still seem to work fine in low-memory mode, Nokia 5100 on the other hand doesn't work). If that is the case, please download an older MGMaps (version 1.07) that uses old map tiles and may need a conversion script. Version 1.10 uses the floating-point library copyright © 2002-2005 by Nikolay Klimchuk and available for free download here. Mobile GMaps version 1.07 beta fixes the bug with saving locations in version 1.06. Make sure you update! Settings are now saved as soon as they are modified, so that the new settings are kept even if the application crashes. The keypad handling code was slightly changed to work better with full-keyboard devices (like Blackberry phones). A "user-agent" header is sent when the proxy is enabled, this will hopefully fool some WAP proxies into allowing MGMaps to connect to the internet. Google has made some interesting updates to Google Maps. Map tiles are now PNGs instead of GIFs (YEAH! ), satellite images are still JPEGs. On the other hand, the latest versions of map and satellite images use the Mercator projection, which means it's more complicated to display the tiles on the mobile phone (I need to use a floating-point library, as most phones do not support floating-point natively in Java). That's what I'm currently working on - once it's ready I'll release a new version with some other small fixes. I got some feedback about version 1.05 not being able to save preferences. I think the only case when that could happen is if you have upgraded from an older version (1.02 or older). If that is the case, please uninstall MGMaps, then reinstall the latest version. Let me know (send feedback) if you reinstalled it and it still does not work. It seems the latest version (1.05) still does not fix problems with Treo PDAs. I am unable to debug it on Treo, since I don't have access to one, or to an emulator with a good ROM image. However, it seems someone else has managed to create an application similar to MGMaps, that works only on Treo and other Palm PDAs, but offers more functionality. The application is called KMaps, and the author is Ivan Mitrovic. If you have a Palm Treo or Tungsten device and want to have mobile google maps on it (and you don't want to wait until I fix MGMaps), go ahead and give KMaps a try at http://www.alealea.com. The development of MGMaps is not my top priority, as I'm currently involved in other (commercial) projects. MGMaps is a free application and I work on it during my free time - so be patient. Mobile GMaps version 1.05 beta was released. Support for PNG images is now implemented (based on this idea). Read this for more details and for links to the conversion script. Low memory mode no longer enabled by default. If the application crashes, restart it and enable low memory mode by changing settings from the welcome screen. HTTP authentication was implemented — for authentication for the conversion script, also proxy username and password are now supported. PNG images mode supported — In order to display map and satellite tiles, JPG and GIF images are passed through a conversion script that provides them as PNGs to the phone. The maximum cache size is now 32 instead of 12. Use large cache sizes for Palm Treo and other devices with large screens. A bug was fixed for loading default settings. The default cache size is now correctly computed. A welcome screen was added to allow you to change settings before connecting to the internet. This will be extended in future versions to allow you to edit locations before displaying any maps. Some bugs in proxy support were fixed. MGMaps should now support more types of proxy servers. The FAQ, the supported device list and the image support document were updated. A TODO list and a list of general known bugs were added to the FAQ. I've learned there are a few phones that support PNG and JPG images, just not GIFs. These phones should be able to display satellite imagery (but not map tile). If the application does not display anything when started or if it crashes, you should try to quickly change to satellite mode (press "0") when the application starts, then once you are viewing satellite imagery, save the location and set it as the startup location. The application will then no longer crash on startup and you will be able to see satellite imagery. RSS for news is available. Mobile GMaps version 1.03 beta was released. For now, it fixes some bugs (locations with longitude or latitude between -1 and 0 degrees lost the minus when saved), and is ready to support map & satellite images as GIFs/JPEGs. This feature is not enabled yet, read this document for details. The configuration data has changed! If you have installed an older version, please uninstall it before installing v1.03. Unfortunately this will erase your saved locations, but I promise this will not happen again with future configuration updates. Mobile GMaps version 1.02 beta was released, it fixes some minor bugs. Mobile GMaps version 1.01 beta was released, it fixes a bug in version 1.00 that did not preserve saved locations. Mobile GMaps version 1.00 beta was released!